Associated Press Investigation Reveals Hawaiian Fishing Fleet Uses Vulnerable Foreign Fishermen : The Two-Way The Associated Press reports that Hawaiian fishing boats rely on hundreds of undocumented workers who can't step foot on shore and aren't protected by labor laws — all thanks to a legal loophole. On March 23, a man unloads fish from the U.S. fishing vessel the Sea Dragon at Pier 38 in Honolulu. According to an Associated Press report, Americans buying Hawaiian seafood are almost certainly eating fish caught by foreign workers hired through a U.S. government loophole that allows them jobs but exempts them from most basic workplace protections. The boats are owned by Americans. They fly American flags and work in American waters. The fish they catch — like premium ahi tuna and swordfish — is sold at American grocery stores, on shelves at Whole Foods and Costco. But the men who catch those fish can't set foot on American soil, The Associated Press reports — and they aren't protected by American labor laws. For more than a year, the AP has been reporting on labor abuses in the global fishing industry. Previous stories have resulted in thousands of slaves being rescued in Indonesia. Later, President Obama banned the import of slave-produced goods into the U.S. But even American fisheries rely on vulnerable populations of undocumented fishermen, The Associated Press writes — thanks to a loophole that excludes Hawaii's fishing fleet from federal laws designed to protect workers. The report specifically looks at hundreds of workers in a fleet of boats catching Hawaiian seafood. "Many come from impoverished Southeast Asian and Pacific nations to take the dangerous jobs, which can pay as little as 70 cents an hour," the wire service reports. "With no legal standing on U.S. soil, the men are at the mercy of their American captains. ... Since they don't have visas, they are not allowed to set foot on shore. The entire system, which contradicts other state and federal laws, operates with the blessing of high-ranking U.S. lawmakers and officials, an Associated Press investigation found." You can read the whole report here, and a brief Q&A on the reporters' findings here. 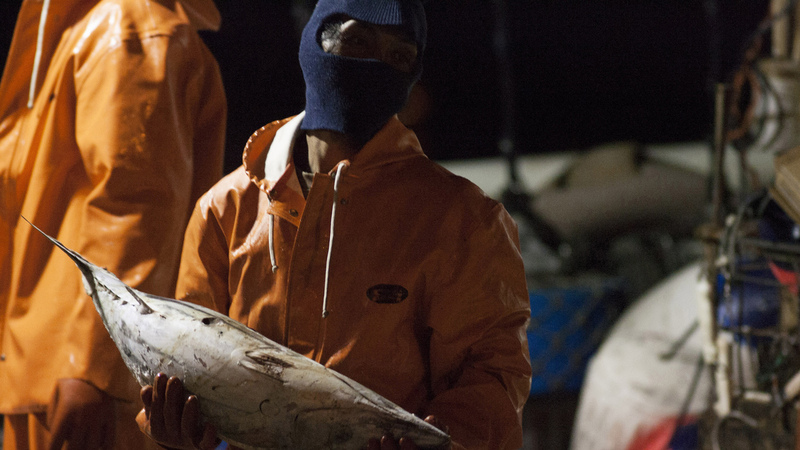 Reporters Martha Mendoza and Margie Mason found that the skilled fisherman would sign contracts that last several years, in deals negotiated by third parties. The fishermen would not be allowed to fly into American airports and would be transferred to the ships at sea — in at least one case, the wire service reports, having to jump in the water and swim between boats. Once on the ship, the fishermen are required by U.S. Customs and Border Protection to give their passports to their captains — a practice that might violate federal human trafficking laws, the AP reports. The pay is far less than the U.S. minimum wage, although often far higher than the undocumented workers could earn in their home countries. If they find the deal less attractive than it seemed, they might be stuck. Fishermen who wish to end their contracts early may wind up mired in debt. "In Hawaii, federal contractors paid to monitor catches said they are troubled by what they've seen while living weeks at a time at sea with the men.
" 'It's unhealthy, quite frankly, for people to have to be kept on the boat,' said Kitty Simonds, executive director of the Honolulu-based Western Pacific Regional Fishery Management Council. 'Maybe there needs to be legislation. I mean, who's going to take that on?' "
Again, you can read the whole piece here.